The graphics specialist's cash flow profile is taking a step back. It's been a roller-coaster ride for NVIDIA (NASDAQ:NVDA) in 2018. The all-conquering graphics chip specialist looked unstoppable for the majority of the year thanks to terrific growth in its PC gaming and data center businesses. However, tragedy struck in mid-November once the chipmaker announced that its growth is going to hit a wall. NVIDIA's revenue growth is expected to drop into the single digits this quarter. The reason: weak demand for graphics cards. Cryptocurrency mining was a key catalyst for graphics card sales and pricing. Miners bought GPUs (graphics processing units) in droves when mining digital currencies such as bitcoin was profitable, creating a supply shortfall that led to a massive rise in prices. But the emergence of specialized mining chips and the declining payoff from cryptocurrency mining means that GPU demand from cryptocurrency mining has waned. This has led to excess GPU inventory in the market. Not surprisingly, graphics card prices have dropped substantially since the year began, leading to a drop in NVIDIA's cash flow. Data sources: Graphics card prices from TechSpot, cash flow data from NVIDIA quarterly reports. Chart by the author. FY = fiscal year. The chart above shows a correlation between the price of NVIDIA's flagship GTX 1080 Ti graphics card at various points during the relevant quarters of 2018 and its cash flow profile. For instance, the GPU price for the fourth quarter of 2018 includes the month of January, when the GTX 1080 Ti was selling for $1,200, as compared to the manufacturer suggested retail price (MSRP) of $700. But the price of NVIDIA's flagship GPU has dropped since then, and this seems to be affecting its cash flow profile. There's no denying that NVIDIA sells many GPUs apart from the GTX 1080 Ti. But I'm focusing on that particular product because it is a high-end offering, which means that it should have been in strong demand by miners and gamers alike. That's probably why its price dropped so much once miners were taken out of the equation. It is also being reported that cryptocurrency miners are selling off their used graphics cards, bringing more inventory into the market and hurting prices. The bad news is that this inventory glut seems to be affecting NVIDIA's new GPUs as well. Its latest RTX 2080 graphics card was available for a $150 discount on the $900 MSRP as part of Black Friday and Cyber Monday deals. That's a big discount for a card that has been on the market for just two months. Therefore, it is likely that NVIDIA's cash flow profile will take further hits, as it expects the glut to last for a couple of quarters. 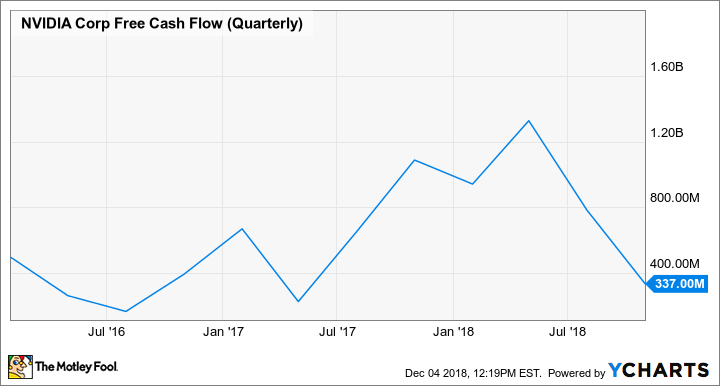 The good news is that NVIDIA has generated nearly $2.5 billion in free cash flow during the first nine months of the current fiscal year despite the recent setbacks, compared to just under $2 billion during the same period a year ago. The company is looking to use the extra cash flow it has generated thanks to the crypto catalyst for boosting investor confidence. It recently raised its dividend by 7% and authorized a $7 billion share repurchase program. Now, the dividend increase isn't going to turn a lot of heads, as NVIDIA's dividend yield following the hike stands at just 0.44%. The company has been very, very conservative when it comes to raising the dividend despite the massive growth in its earnings and cash flow over the years. If NVIDIA wanted, it could have tripled the dividend without breaking a sweat, and still been left with enough money to invest in other activities or even reduce the debt. But NVIDIA has chosen to boost the share repurchase program, which could allow it to buy back nearly8% of its total outstanding shares at the current market capitalization. Clearly the company is looking to support its earnings by reducing the share count, but at the same time, the scope for a substantial increase in its dividend drops out of the equation. Moreover, NVIDIA's quarterly free cash flow levels have now dropped to the precryptocurrency catalyst period, which began in mid-2017 and lasted through February this year. So investors shouldn't expect NVIDIA's cash flow to rise to the dizzying heights seen over the past year or so. However, the company's cash flow performance could improve, provided the technological advantages delivered by its data center and PC gaming chips strike a chord with customers. NVIDIA is packing new technology into its 20-series GPUs that arch-rival Advanced Micro Devices doesn't offer yet, while it is looking to make headway in artificial intelligence with its inferencing GPUs. Assuming that these innovations are a hit with customers, NVIDIA can reclaim its pricing power and build up its cash flow profile once again. Until then, NVIDIA investors will need to remain patient, as it looks set to witness turbulent times in the near term.